The already fifth negotiating session between our joint negotiating team of trade unions PRO-GE and GPA-djp and the employers of the largest subsector in metal industry, the association for the metal technology (FMTI) covering more than 130.000 workers/employees in machinery and metal ware production, was broken off in the late evening hours of November 8th, 2018. Though during the first six hours of negotiations an agreement on framework conditions regarding remuneration of overtime pay seemed already tangible, employers withdrew their consent at the last minute. With the failure of the framework part, an agreement on wage increases was not in sight and the session was broken off. After the negotiation session failed, employers phoned and came up with an offer of 2,7 percent wage increase instead of the 2,02 percent offered during the fourth round. 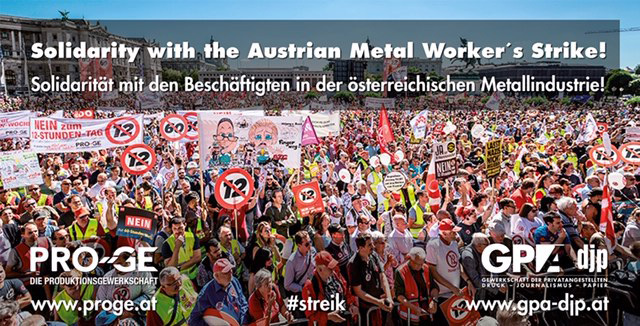 Our negotiation team rejected the employers´ offer by phone as not serious and stressed again that, given the overall excellent economic situation in the metal industry, a mere 2,02 percent increase will only offset the inflation rate and therefore be insufficient. On Monday 12th November trade unions will reconvene the suspended meetings with the workers in companies of the affected subsector to inform and discuss about the situation in the bargaining round. From Monday 12th noon till Wednesday, 14th November midnight in 350 companies of the FMTI subsector warning strikes are foreseen. Meanwhile negotiations in the other five subsectors of the metal industry will continue as planned.